Are you consistently showing up in the “map pack” (see below) for local searches? Showing up in this set of local listings that takes up nearly the entire top half the page in Google is crucial to the success of your business. 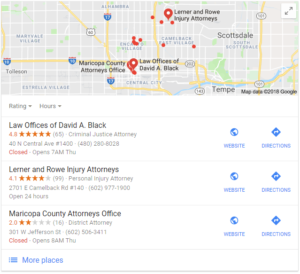 While “Local SEO” has similar elements to overall SEO, there are some very specific things we do for your firm to help increase your local visibility. One simple example of how we can help is in making sure your firm is correctly identified online. Search engines use something we refer to as “NAP,” or the Name, Address, and Phone of your firm for each location. One of the foundational elements of local search is making sure that these elements are consistent across the web. For example, if you have gone through a firm name change, inconsistencies in name, address, and phone can be devastating to your rankings in the search engines. This will require cleaning up as many instances as possible of that old firm name, changing it to the new name. The same would be true for an address or phone number change. In addition to cleaning up these existing “citations” or instances of your NAP, we help you build new citations. We also help you build local links using the link building methods discussed on our link building page. Other factors include reviews, using social media, local-focused content creation, and optimizing your profiles in places like your Google My Business page. Using an expert is worth the expense, especially for law firms, where every conversion could represent an enormous case.